Sometimes a home gets remodeled one room at a time. Often clients we’ve worked with before contact us for help with additional home design and room remodeling projects. This is exactly what happened when longtime clients of ours asked for help with their master bath remodel. After working with a plumber and contractor to fix a leaky shower stall, they learned that the water damage was enough to require more extensive repairs. They decided it was a great opportunity to remodel the entire master bathroom. Before any additional work was done, we sat down with the homeowners to find out what they were looking for in their new bathroom. First and foremost they wanted to remove the existing “orange oak” cabinets and replace them with a more neutral “spa-like” palette. Beyond that, they were looking to Pegasus Design Group for help. Bathroom tile, texture and beauty create the illusion of space. For this master bathroom remodel, it was the homeowner’s initial tile selections they made that really began to guide the desired palette of colors and textures we used throughout the bathroom. The decorative tiles included soft cream, tan and soft grey colors. We were able to incorporate a striking basket-weave tile as a focal feature in the shower and inside the niches. On the bathroom floor we used 24” X 24” porcelain tiles laid on the diagonal to visually open the floor space and make the room appear larger and more spacious. We fashioned the tile base against the wall using three different tiles to give it a truly custom look. Unique shower door features set the tone. Unique features can really set the tome of the room. 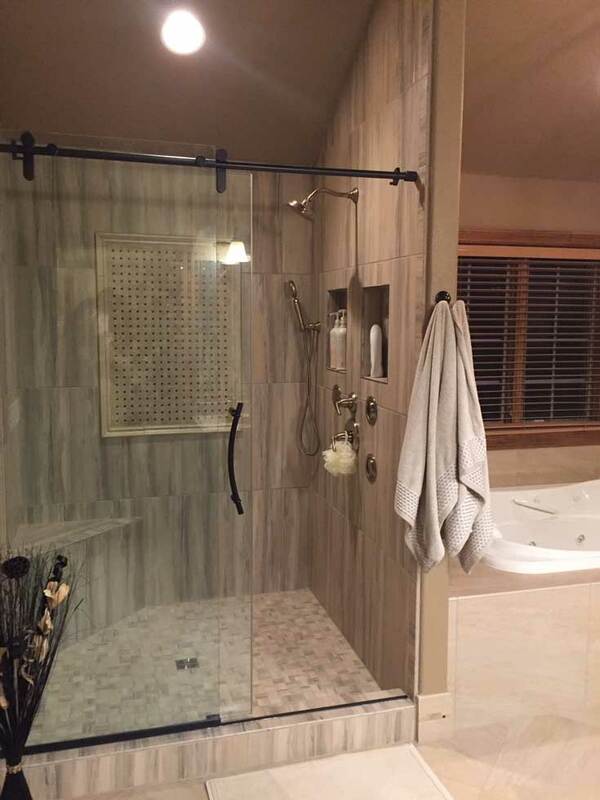 To add to the spa-like feel the homeowners were looking for, we suggested a frameless barn-door style glass shower enclosure to enhance all of the shower components. In keeping with the client’s very first wish we found an alternative to the orange oak cabinets they wanted to replace. New bathroom vanity and linen cabinetry with a dark espresso finish added contrast and warmth to the softer tones of the room. The finishing touches were new plumbing fixtures with vibrant brushed bronze finish and a luxurious air jet tub. The team of interior designers at Pegasus Design Group can help you design a master bathroom escape for your very own. Contact us today to learn about how we can help you.